N28AA, serial number 2239, was formerly registered as NC25666, N25666, and N139PB. Photo by D Stevens Ebbett Productions, 2013. The Douglas DC-3, arguably the most important airliner of all time, revolutionized the airline industry in the late 1930s and continued flying with major trunk airlines well into the 1960s. In the '70s and '80s, DC-3s continued to fly with smaller carriers and dominated the commuter airline scene in south Florida. PBA, short for Provincetown- Boston Airline, was the most famous of those operators. One of PBA's "threes", N139PB, now registered N28AA, is alive and well south of Atlanta. DC-3s have always been a favorite here at Sunshine Skies, particularly those that flew for PBA. Several years ago I asked Ron Alexander, long time owner of ex-PBA DC-3 N28AA, if he had any recent pictures of his aircraft to include here. He answered with a detailed history and dozens of fantastic shots that chronicle N28AA's seven amazing decades of service. Great stuff! Ron Alexander owned this aircraft for 25 years and regularly flew it in a variety of roles: It served as a promotional aircraft for his various companies; it was used for flight training; it was a popular attraction at air shows; it appeared in several major motion pictures in the past decade and even hosted an inflight wedding. Tragically, Mr. Alexander was killed in the crash of a restored JN-4 Jenny on November 17, 2016. He and his generosity will be sorely missed. DC-3 N28AA is now owned by Ron's friend Jim Sells and it remains stationed at Peachtree City, GA.
Before we get into the history of the aircraft, here are a couple of photos of the cockpit and cabin courtesy of Ron. Although several rows of seats have been removed, the passenger cabin essentially looks as it did when it was flying with PBA in the 1980s. 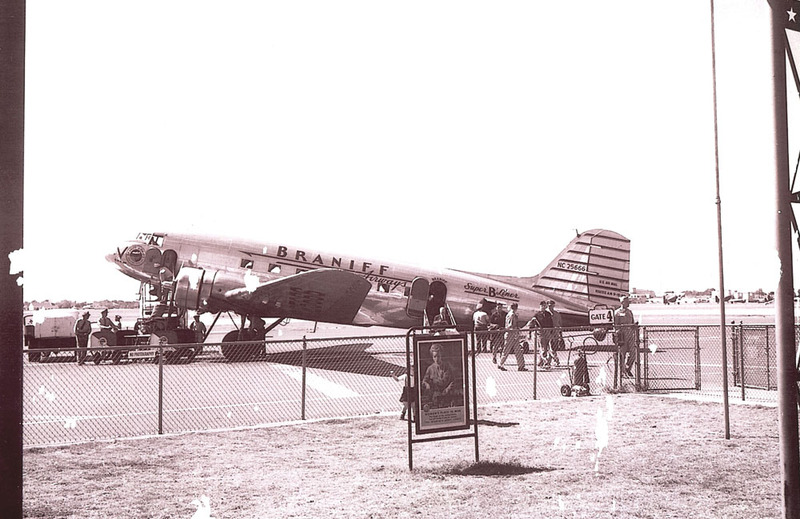 Tom Braniff, president of Braniff Airways, ordered the company’s first DC-3s on August 29, 1939. He received delivery on the first four on December 17, 1939. 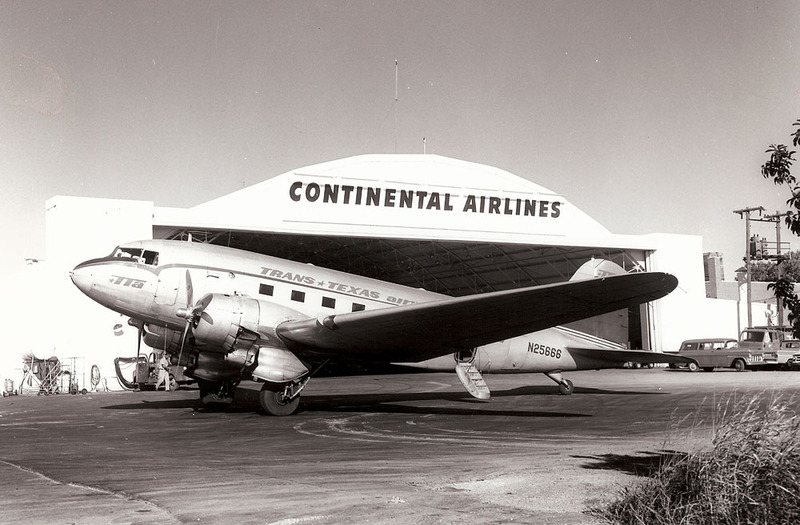 Four more DC-3s were ordered by Mr. Braniff on March 21, 1940. These were delivered on June 20th with the first of the four being a DC-3A, serial number 2239, registered at that time as NC25666. The airplanes were initially used between Chicago, Kansas City, and Dallas. Below: NC25666 in Braniff colors during World War II. Photo courtesy of Ron Alexander. Braniff Airways operated NC25666, later registered as N25666, until April, 1953 when it was sold to Trans Texas Airways. TTA operated it throughout their route system for 15 years. Trans Texas operated N25666 from 1953 to 1968. TTA streamlined the aircraft by adding landing gear "speed-packs" and tighter engine cowlings. Photo courtesy of Ron Alexander. Trans Texas Airlines became Texas International and the airline sold N25666 to Tradewinds, Inc. (located in San Antonio) on February 4, 1969. Tradewinds sold it to Air Mid America in September, 1970. 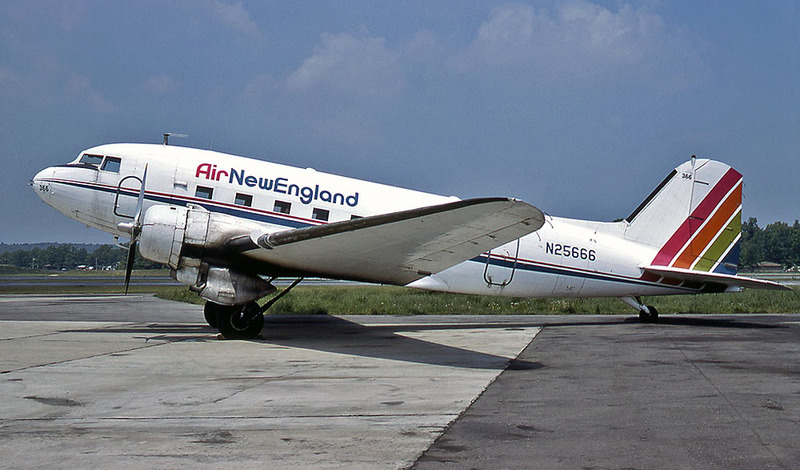 N25666 was sold yet again in 1971, this time to Air New England which operated the DC-3 for 6 years. It is pictured here at New Bedford, Massachusetts in June 1977. Photo by Bob Garrard. Cryderman Air Services, Inc. purchased N25666 in 1977. Located in Pontiac, Michigan, Cryderman operated the airplane only about 1 year when it was sold to Century Airlines. 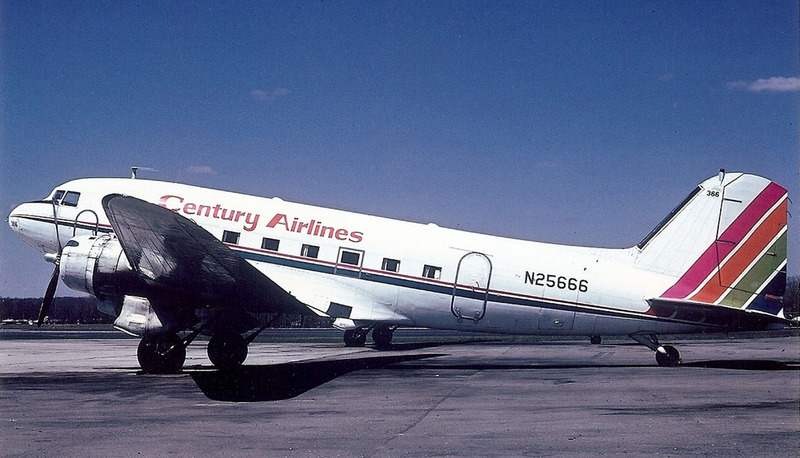 Century, also of Pontiac, kept the airplane only a few months before selling it to Provincetown-Boston Airline on June 13, 1978. Photo courtesy of Ron Alexander. Provincetown-Boston Airline / Naples Airlines registered the airplane as N139PB. 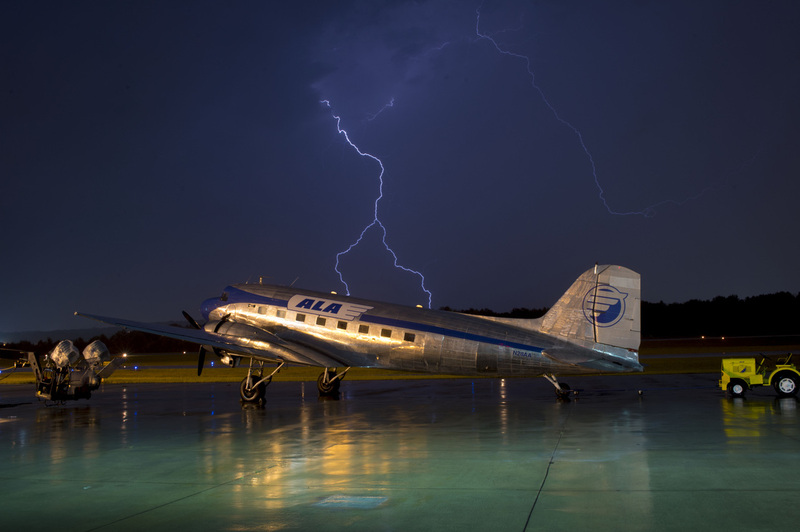 The PBA / Naples DC-3 operation was seasonal and aircraft flew out of Cape Cod, Massachusetts in the summer shifting to ﻿Florida during the winter. N139PB was an integral part of the airline. As Provincetown-Boston / Naples Airlines expanded beyond its namesake markets, the airline became known simply as PBA in 1980. By 1984 it had become the largest commuter airline in the world and operated a fleet of 12 DC-3s along with Martin 404s, YS-11s, Embraer Bandeirantes, and a huge fleet of Cessna 402s. "I was flying N139PB from TPA to APF one afternoon, with F/O Will L. Will was a new F/O and I was a new DC-3 Captain, so this would have been right around the end of June 1979. We were flying past Punta Gorda, and that airport was completely obscured by a heavy thunderstorm. As I recall we were flying VFR at 7500 feet. I lowered the nose to begin a shallow descent into Naples. As I eased the power off ever so slightly, the left propeller ran away. The noise was incredible as the overspeed reached about 3400 RPM, or 700 RPM above the redline. I had a David Clark headset on, but it was still very, very loud. I immediately closed the throttle, pulled the prop control full aft and hit the feather button. I could see the prop slowing down in my peripheral vision, so I thought the prop was feathering - good! When it stopped turning, I looked out and found the prop blades to still be in the flat position - the engine had seized! Luckily the gears in the nose case had held up under the strain and didn’t allow the prop to uncouple - because free-spinning unlubricated propellers were known to start fires or even depart from the airplane! We only had 12 people on board and the airplane easily handled the “flat” pitch of the propeller, since it was stationary. Landing at Punta Gorda was out of the question because of the thunderstorm at the field. We landed at Page Field in Ft Myers. One of our senior mechanics (Howard Hollis) and his wife were sitting in row 1 on the left side - so he had a bird’s eye view of the whole event. After we landed he tried to move the left propeller by hand but it wouldn’t budge - he could do a pull-up on it! Obviously, an engine change would be required. N139PB was non-standard from the rest of the PBA fleet - with the gear doors and the tight “speed cowls.” The speed cowls required engines with larger cooling fins, so the engines were non-standard too. PBA took this opportunity to standardize N139PB, and changed both engines, put on standard cowls, and removed the gear doors." PBA was bought by Bar Harbor Airlines in February 1987 and began operating as Eastern Express later that year. One of Bar Harbor's priorities was modernizing its fleet and all DC-3s were retired on the evening of September 6, 1988, ending 52 years of continuous DC-3 passenger service in the contiguous United States. PBA's operating certificate was retired the following day. N139PB sat in storage at Naples and Tamiami Airport for the next 3 years. It was in sad shape at Naples, Florida when Frank Schaefer took this photo in March 1991. Starflite Corporation offered N139PB, which had been parked at Tamiami, for sale in Trade-A-Plane. Ron Alexander, owner of Alexander Aeroplane Company, purchased it from Starflite on July 18, 1991. The airplane was ferried to its new home at the Griffin, Georgia airport where it was completely gutted and refurbished by Ron and Alexander Aeroplane employees. The process took almost a year to complete. Ron then registered the DC-3 as N28AA, the last two letters indicating Alexander Aeroplane. The airplane was then used as a promotional tool for the company, flying to airshows throughout the country and being placed on display. 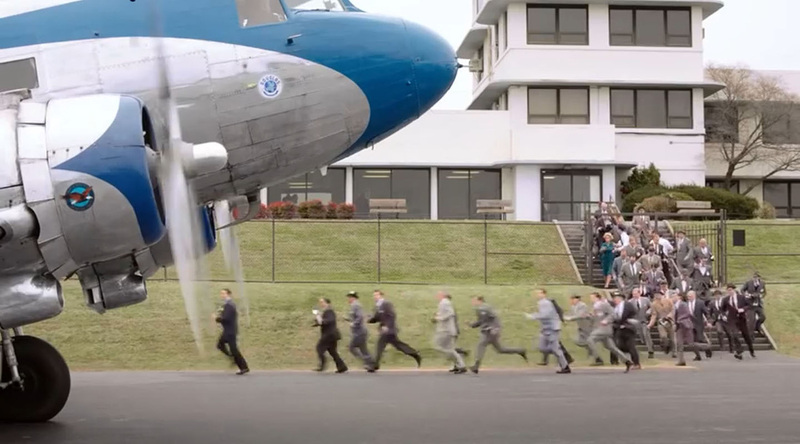 Hundreds of people enjoyed touring the airplane and riding aboard it. A program was developed allowing pilots to rent the airplane for a day to receive ground and flight instruction. This provided the individuals with a taste of what it was like to fly this beautiful airliner. I took this photo of N28AA with Alexander Airplane titles at its home in Griffin, Georgia in August 1992. Academy Airlines' ill-fated Carvair N83FA is seen in the background. 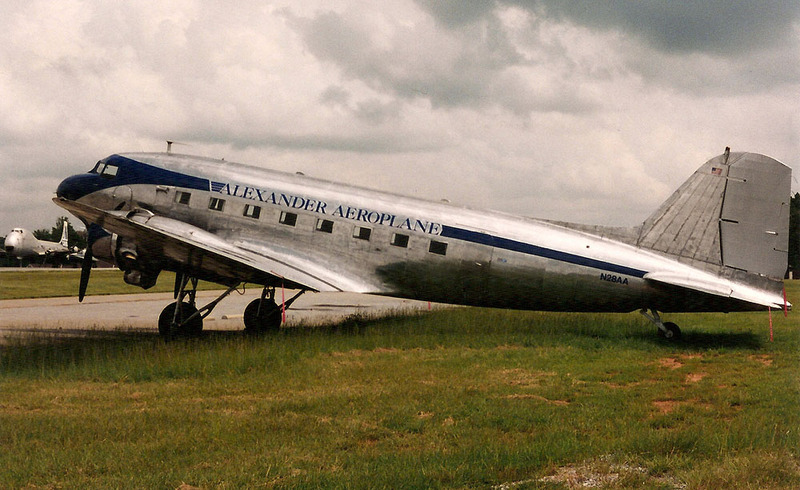 In January 1996 Alexander Aeroplane Company was sold to Aircraft Spruce and Specialty. Ron kept N28AA and began using it for dual instruction. Since he also owned Poly-Fiber Fabric Coatings, the company name was painted on the fuselage. Ron was also the Chief Pilot for the restored Delta Air Lines DC-3 program for several years, and N28AA was used to instruct the pilots involved in the Delta program. Below: N28AA seconds from touchdown at Lee Bottom Flying Field near Hanover, Indiana. Photo taken September 26, 2008 by Rich Davidson and sent in by Ron Alexander. Rich Davidson also took this evocative photo of N28AA on a foggy September morning at Lee Bottom Flying Field in 2008. Several people forwarded this stunning photo taken by J. Michael Travis of N28AA making a low pass at Williamson on November 11, 2008. The next three photos were taken by David Hartman, webmaster of AircraftPhotography.net Aside from being a fantastic photographer, David is also an aircraft mechanic with an obvious love of these great machines. Here's the view from the best seat in the house! Newnan airport and I-85 can be seen in the distance while the DC-3's shadow can be seen at bottom right. August 2009. N28AA with new Candler Field Express titles parked in front of the first completed phase of the Candler Field Museum in Williamson, GA. September 17, 2009. The museum was established to recreate Atlanta airport as it appeared in the 1920s and 30s. Photo courtesy of David Hartman. 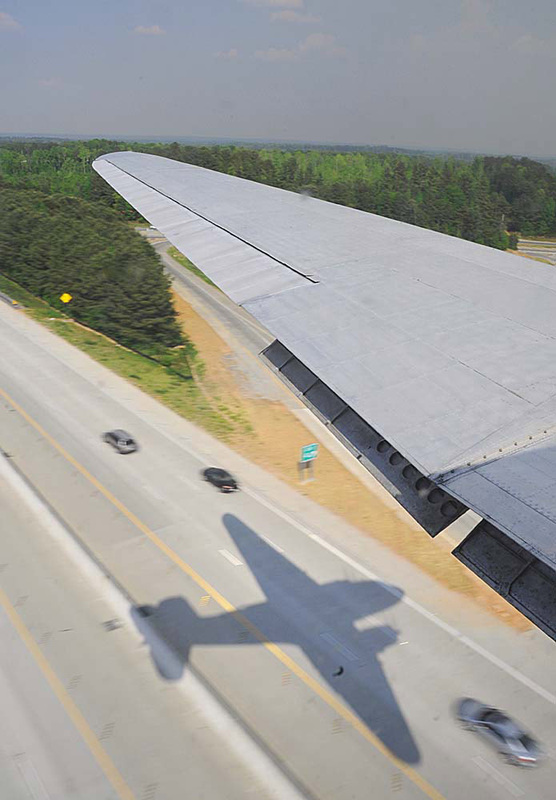 A great shot of the classic DC-3 silhouette blasting across Interstate I-85 during final approach to Newnan, GA on April 10, 2010. This is also an excellent illustration of DC-3's split flaps. Photo courtesy of David Hartman. During 2012-2013, N28AA was active with movie and television work. Cubana titles and stripes were applied in 2012 for a television show shot in Miami. Photo courtesy of Ron Alexander. ALA markings were applied for 42, a movie about the life of Jackie Robinson. These markings were left unchanged in the Errol Flynn bio The Last of Robin Hood. The DC-3 scenes in Robin Hood were shot at Fulton County airport near Atlanta in February 2013. N28AA can be booked for flight training through DC3Training.com. Their short promotional video features some great action shots. Following the passing of Ron Alexander, N28AA was purchased by Ron's long time friend Jim Sells in early 2017. Below: Jim Sells, unidentified flight attendant, Ron Alexander. Thanks again to David Hartman, Rich Davidson and Ron Alexander and others for their photos! NEXT PAGE: PBA DC-3s: WHERE ARE THEY NOW?